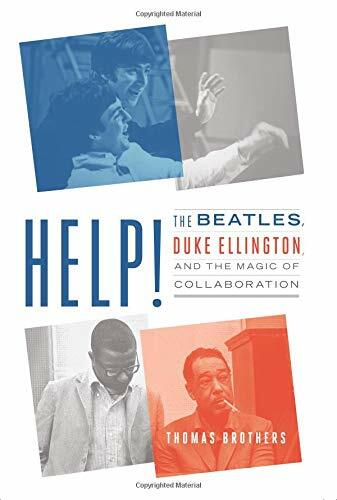 Author Thomas Brothers tries mightily in this dense but insightful book to tie his thesis together, namely that two of the biggest musical geniuses of the 20th Century—Duke Ellington and The Beatles—succeeded so well because they shared the common gene of collaboration. And while that may be somewhat true, their way of working within music was so vastly different that it doesn’t seem to make much sense to link these musical forces together. Brothers, who has written previously about Louis Armstrong, points out that Ellington was not a composer but rather a master arranger. He leaned on two masterful songwriters, Bubber Miley and later Billy Stayhorn (who actually wrote “Take the A Train”). Help! is very much two almost distinct books. The first half is all Ellington and the second all Beatles. Both are very good and instructive about their respective subjects but, depending on your musical tastes, you could surely skip one and delve into the other. The second half of the book about the Beatles is a worthy successor to Revolution in the Head, one of the first in a parade of books that took the Beatles music extremely seriously. Brothers, not surprisingly a professor of music at Duke University, puts his intellectual spin on Beatles material pulled from a variety of sources. He outlines what he believes they were doing in a way one suspects that Lennon & McCartney never fathomed. Take the song “Tomorrow Never Knows,” a psychedelic frenzy of backward sounds, tape loops, exploding drums and Lennon’s voice soaring above in an eerie screed commanding us all to tune in and drop out. At the time it was released, no one had heard anything like it. McCartney—the most musically advanced of any Beatle—knew what to do and he succeeded with collaborative help of the other Beatles, George Martin and engineer Goeff Emerick. It was a teenage Emerick’s first day in the studio as an intern for George Martin and this was dropped in his lap. (Emerick sadly died recently but he left us his own great book on Beatles music: Here, There and Everywhere.) He rose to the challenge, running Lennon’s voice through Leslie speakers to fulfil the songwriter’s command that his voice should sound like like he was the Dali Lama speaking from a mountaintop. This book makes you feel good once again about being a Beatles fan and makes a good case for unabashedly stating that it is possible this most celebrated band is actually underrated. And the same could be said of Ellington whose status continues to grow. Not bad for a guy born in 1899.